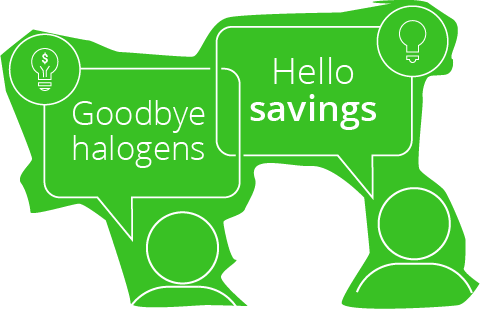 save $326 per year on your energy bills. *Based on: 20 lamps at a 26c/kwh tariff, old lamps are 50w halogen, new lights are 7 w LED Volume of lamps, hours of operation 4 hours per day, 365 days per year. Energy cost of old lamps is $379 per year, energy cost of new lamps equals $53 p.a. Even if an installation fee applies, the amount you'll save in electricity charges will offset this in as little as 4 months! Old halogen lights burn so hot they can create ugly, yellowing marks around the fitting. We are pleased to offer a premium product that when installed, completely disguises these marks and makes it look like you have a whole new ceiling! Halogen lights get oven-hot (300+ C). LED downlights are much cooler (<80 degrees) so your home is safer and more liveable. Electricity costs are rising in every state across Australia.Some experts predict the increase will be between 5% and 40% . By decreasing the amount of electricity you are using, you protect yourself from increased electrical costs. LED down lights last up to 10 years, which means you won’t have to bother changing them for a long time. All installations are done by a qualified A Grade electrician, using only best government approved products. We also stand by our service with a 12 month warranty. Not all LED lights are equal. Unlike old school lights, LED lights are sophisticated electronic devices. The quality of components and design affect reliability and performance. Our quality LED lights are designed for long life and high performance. Designed for maximum efficiency. Get the brightness of a 50W halogen light using LEDs under 8W. Excellent light output in warm colours (520+ lumens) – as bright as a 50W halogen. Upgrading 20 downlights permanently offsets the emissions from your own car plus 5 of your friends. Eliminate your old transformer. This saves you more power and avoids the risk of costly replacements. Our quality LEDs have been designed for long life. They will shine for years to come. (Rated for 25,000 hour lifetime). 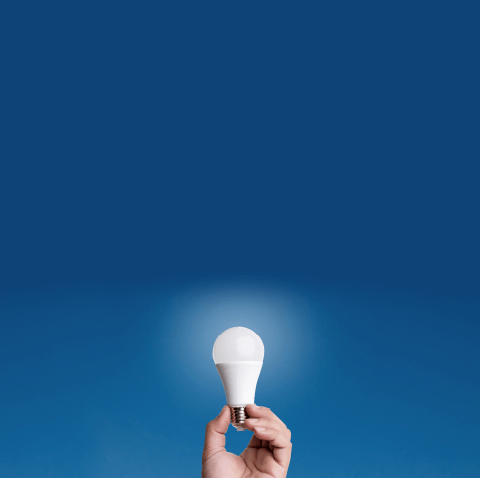 Are you eligible for FREE LEDs courtesy of the Victorian Government Energy Saver Incentive scheme? You may have heard that it’s possible to get FREE LED light replacements courtesy of the Victorian Government. 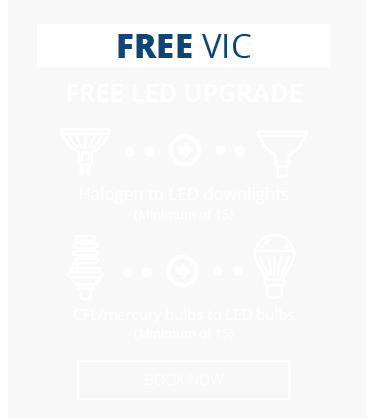 Under the Victorian Energy Saver Incentive scheme (also known as VEET), which was originally implemented to improve energy efficiency in homes and businesses across Victoria, it’s possible to upgrade your old halogen lighting to new LED lighting without paying anything for your new bulbs. However, as with any scheme, certain restrictions apply. The free LED replacement bulbs for halogen lights applies to residents and businesses in Victoria only. Please note that we do charge a $59 installation fee on all exchange installations. The VEU (previously VEET) subsidised upgrade is only applicable for 12V halogen downlights. If you’ve already had work carried out to replace halogen with LED or energy saving fluorescent lights, we’re unable to offer you an upgrade under the scheme. For residential premises, the halogen light LED replacement offer only applies to ceiling downlights under the Victorian Energy Upgraded Program. If you have a transformer in the ceiling that is coupled to your downlights, we will need to assess it for compatibility with our LEDs. If the transformer is incompatible, unfortunately we won’t be able to carry out a subsidised upgrade. Halogen downlights with an MR16 or GU10 base are both eligible for free LED replacement during an upgrade under the scheme. If you have a dimmer switch on your halogen lights, the VEET scheme now covers lighting systems that have GU10 fittings with a dimmer switch attached, therefore you will be eligible for free LED replacements. If you are eligible for a free LED replacement for halogen bulbs, we will install 3000K warm white LEDs that are very similar to the light emitted by the majority of halogen downlights. These are not only considered the best direct LED replacement for halogen bulb systems, but they’re the most comfortable and typical colour choice for most homes. Can businesses benefit from the scheme? Some businesses in Victoria are eligible for a free upgrade of their commercial halogen lighting to energy efficient LEDs. To find out whether your business may qualify, get in touch with us here at Energy Makeovers. Any questions? Want to book an appointment to have your free LEDs installed? If you have any questions about your eligibility for free LEDs, or you want to book one of our electricians to come and carry out the upgrade, please contact us here at Energy Makeovers either by calling us on 1300 788 776 or completing our online contact form.